Very nice and interesting post here.. keep it up. Carlos has moved. The truck is at a construction site south of campus (not sure where) through lunch and then is in the parking lot of the convenience store at the corner of Highland and 5th Ave. from 1-9 PM M-Fri. As far as I can tell this si the first taco truck i nthe campus area. Disastrously for me, this is directly on my bike commuting route home from work. I had the lengua taco today as a first sample and it was delicious. Perfectly cooked meat. I predict I will be eating there quite often on the way home. Junior’s is now on High just south of Hudson, immediately south of Taco Bell. We had the tacos today, one of each kind and they were just $1.50/each. We loved them all. Owner was such a nice guy too. Confirmed. Carlos is in the parking lot of O’Reilly’s Auto Parts (formerly Hollywood video) just south of Taco Bell @ Hudson & High. He says he plans to be there for two years…? Also confirmed- Carlos is extremely friendly and is looking for business- the construction cant be helping him. If you are in the vicinity, stop by and grab some food. There are no other trucks in the N Campus/Clintonville region so this is a huge score!!! had the Best burrito ever at Juniors one Thursday night…….Went back on Saturday, ordered the same thing and had the Worst burrito ever…..WTF??? gone for two days now. worried. what’s up? Just called ’em – they’re back on 5th St. in Victorian Village now (and say they’ll be there for a while). Thanks for letting us know that they moved again. Oh the tease! I was elated to have a truck in the N Campus/Clintonville area. Oh well, it was an excellent three days! oh my god, if you don’t like the food, go there to see his daughter….amaaaaazzzing..
Yep, they’re in the Dairy Family parking lot on 5th and Hudson. We went the other night. I got the veggie burrito which was seriously incredible. My fiance got the Torta with chorizo, I only had a bite, but it was quite good as well! where can I get some ceviche? There are at least a couple of options: Tacorriendo does a nice ceviche tostada, and Mi Chula has an excellent range of ceviche and other seafood related offerings. I never cared for the truck outside Las Maravillas. Junior’s is *WAY* better. Had carne asada and al pastor, very delicious. Hoping they stay down here in the Vic Village, otherwise there is nothing else close by. Carlos said he had been here in the convenience store parking lot for the last two weeks. They are open till 10PM everyday. jesus, James was right…the food is amazing, his daughter even better. Absolute cutie, and the whole family is nice. Not here Monday lunch time. Today was the first time that I found this truck. It was worth the wait. Three Lengua tacos and one tamale. I agree with Schriner about the quality of the lengua. It was the best that I have had. The tamale (roja) was also very good. Went with some friends to Junior’s, absolutely first rate taco’s and very friendly service. He mentioned to us on the way out that he was looking into getting a tent and some heaters for when the weather turns. I think I am going back for dinner now! The OSU Food & Culture club made a stop here last night. Most of us got some kind of burrito and they were excellent, much bang for the buck and very tasty. The service was wonderful & friendly. At the end of our meal, he gave us a sample of a “hot chocolate” (not very chocolately, more cinnamon, vanilla, a little apple-like) he is thinking about selling this fall along with some cookies or cakes as dessert items. Glad you enjoyed. In the OSU campus area, I’d also recommend that you stop at El Manantial (corner of Lane & High, in Shell station parking lot). They do some interesting Colombian food. Just stopped in to get my lunch taco fix and had his mexican chocolate, and it is quite good, and warming….agree not too chocolatey but good none the less. I LOVE this place. When it’s at Dairy Family, it’s dangerously close to my house which is AWESOME. Veggie burrito is divine. Try it, try it, try it! Junior’s is great. I’ve been indulging in his fare since he showed up at the Dairy Family lot this summer. I’m a big fan of the chicken tacos. My wife loves the vegetarian burrito. Hope he sticks around during the cold winter! Carlos (from Zacatecas in the north-central part of Mexico) is a great guy. His wife sometimes runs the truck on weekends and the whole family is a buena onda. Our vegetarian friend really liked what Carlos made and Carlos said he will be adding tofu as well as a big tent with a space heater. 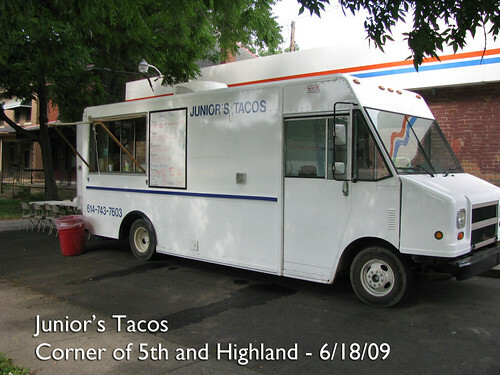 Day four of the Taco Truck Tour – Juniors was open and I gave it a shot. Four tacos (Asada, Pastor, Pollo and Carnitas) and an Asada burrito. The pollo, asada and pastor were good, but kinda of middle of the road for what I;ve tried locally so far. The carnitas however was incredible and is the best so far. The burrito was unique in that it had rice and whole pinto beans rather than refried, along with lettuce, tomatos and sour cream. The red salsa was lots of hot but little flavor while the green salsa was not hot at all, but very nice flavor. Junior’s tacos are so friggin’ good. The best food on earth. The al pastor are my favorite, but I’ve tried a few others and they are also great. The salsa verde is super with the al pastor. you won’t be disappointed. muy ricos los tacos excelen pero son mejores los de otras taquerias no desir nombres pero es la verdad…………………………………………………………………………………………………………. Hey guys! My wife and I are gonna be in Columbus for the weekend..we are staying at the Mariott downtown…We really dont know our way around well. Can you suggest someplace close to there? Tks! This truck (Junior’s) and Taqueria Davanne are easily the two closest trucks to downtown (and they’re within 100 yards of each other). Hope you get the opportunity to check them out. Taqueria Davanne also does Tamales on Saturday. Definitely worth checking out! And Junior’s is always wonderful as well. I just got home from this one and it was soooooo good! I had the veg burrito that I’ve heard so much about and it was so amazing! It had yummy grilled fajita veggies, rice, beans (not refried, but so soft and yummy) cheese, lettuce sour cream and tomatoes. SO had the asada tacos which he said were great. I lived in Phx for ten yrs so I was happy to find this website!!! Thank you so much. Thank you Junior’s tacos!!!!!!!!! I live a block from Junior’s and eat there about once a week. The food is so delicious every time! I had the vegetarian burrito the other day and It’s my new favorite. I just tried Junior’s for the first time today. I had the pastor. It was honestly pretty disappointing: Tough and chewy. I’m definitely a Taqueria Davanne fan. Junior’s was closed for a while today (4/1, not an April Fools joke). Looked like they were working on the truck to upgrade it. Doing a bit of painting and whatnot. Said they might be open later today, but did not give a specific time. Pretty good tortas. I give a 7 out of 10. Slightly sparse on the steak. I haven’t tried the other food items. For those who were wondering, there is the possibility of Junior’s bringing a truck to one of your events. I was at a house party this week and the mobile truck came to sell tacos! So if you are having a party and want something out of the ordinary, definitely check with Junior’s. Junior’s does definitely do catering. They have a second truck (which you will see parked across the parking lot at the convenience store at 5th and Highland) that is used exclusively for private parties. I talked to them last time I was there – they will bring the mobile truck to your party or event and cater from the truck. primo se miran buenos los tacos y este momento tengo ambre. ase falta probarlos. Junior’s catered my wedding two weekends ago and did an excellent job. Not only did he bring his second truck to serve food to order, Carlos also prepared a ‘make your own’ taco buffet complete with tamales. We had around 175 guests and everything ran smoothly and everyone had great things to say about the truck and their food. I highly recommend them for events. Carlos was professional, easy to work with, and exceeded our expectations. Tried it for the second time. Pales in comparison to Davanne. i am sure that juniors is not owned by Carlos any more. i was there on 6/5/2013. the tacos i got were not near the ones that Carlos served. that was my last visit to that truck. FYI…Carlos, does own Junior’s still. The steak tacos I had this week were excellent.